This timorous and gregarious herbivore has long powerful hind legs and gripping feet perfectly adapted for rapid movement. Its two 'winglets' on the crest of its back that enhance its balance, allowing it to run very swiftly in leaps and bounds over difficult terrain. Gubanis have a well-developed sense of smell along with sensitive hearing allowing them to keep on guard against predators while feeding. They have powerful and large incisors for gnawing and live in the jungle and Prime Roots. Naturally immune to Slow Movement and Root. Highly resistant to Cold magic. Moderately resistant to Rot magic and physical piercing damage. Partially resistant to Electric magic. Gubanis can dispell beneficial effects, such as Invulnerability. 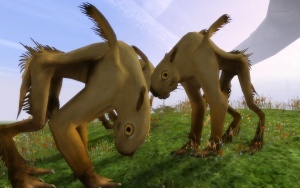 Gubanis are extremely social, they will even defend other nearby herbivores. This page was last edited on 24 July 2018, at 22:02.